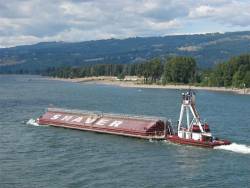 When changes to requirements were made for ship berthing tugs operating on the Columbia River and its tributaries, Shaver Transportation was faced with a serious problem: one of their tugs, the M/V Umatilla, was rendered unusable for ship berthing and no longer able to produce revenue. As one of the most successful marine transportation companies operating on the Columbia River system since 1880, it was essential for the Umatilla to get back to work on the river. Shaver turned to Pacific Power Group to revitalize their vessel and put it back into money-making service with a propulsion and performance upgrade. As the Umatilla is a veteran tug with has provided many years of dedicated service, Shaver and Pacific Power Group sought a cost-effective way to repower the vessel without brand new engines. Recently, Pacific had sold new engines to repower a private yacht that was due for an overhaul – the owner had no use for the original MTU Series 4000 engines which had very low load factors and hours in use. Pacific began in-depth research and calculations to see if it the yacht engines could be converted for commercial tug use. A survey was performed on the 8V4000 M90 engines and PPG determined that the engines could indeed be converted. A deal was made with the yacht owner to purchase the used engines and begin converting them from pleasurecraft use to a suitable source of power for the Umatilla and its rigorous duties. The expertise and creative problem solving provided by Pacific Power Group supplied the Umatilla with a power and bollard pull upgrade while costing less than half the price of new engines – a great value for Shaver Transportation that continues more than 30 years of business partnership between the two companies.